With five weeks of the season complete, there are some teams that are heads and shoulders above the rest of the conference (Houston, Temple, Memphis and Navy), some that have the potential to play spoiler (Cincinnati, East Carolina and Tulsa) and a bunch of other teams still trying to find their way and get enough wins to become bowl eligible — I mean, there are like 100 bowl games now, so it shouldn’t be too far fetched to see at least six teams from the conference in the post season. The Bearcats can’t win a game in-conference but you send one of the ACC’s best into Nippert Stadium in the Miami Hurricanes and Cincinnati handles them with little problem. Freshman Heydan Moore had another good game — 279 yards and two touchdowns — and the Bearcats did a better job handling the ball as a first quarter interception was its only turnover. Running backs Tion Green (15 carries 90 yards) and Hosey Williams (11 carries 80 yards) provided balance to an offense that had over 300 yards in the first half alone. The Owls stepped out of conference to face FBS newbie UNC-Charlotte and while the 49ers outgained the Owls 354-322 it was the only advantage UNCC had as Temple had the advantage that mattered the most… the scoreboard 37-3. Temple’s pass game statistically did not fare well against the heavy rain as P.J. Walker only completed 48% of his passes for 131 yards; Jahad Thomas was able to still run for 109 yards and got into the endzone twice. Surprisingly even with the weather being so bad, both teams did a good job with handling the ball and only had one turnover each. It’s hard to win against anyone when you give up 539 yards of offense, but despite that glaring stat the Huskies hung in late against BYU but came up short 30-13. Another telling stat that doomed UConn in was the lack of third-down conversions as the Huskies only converted three in 14 tries. The defense did its best to keep the team in the game as Jamar Summers and Jhavon Williams each intercepted Cougars quarterback Tyler Mangum. Running back Arkeel Newsome led the offense with 131 total yards and a touchdown. For one half it looked like the USF Bulls were going to pull off a major upset and get head coach Willie Taggart his first signature win in conference as the Bulls led Memphis 10-7, but when the team came out for the second half things seemed different and it cost them. Quarterback Quinton Flowers had a good statistical game — 65% completion rate and 199 yards — but it seemed as if the Bulls offense seemed to stall out at the most inopportune times as it only Converted only 2-of-13 third-down attempts. Marlon Mack continues to show why he could be one of the best backs no one has heard of as he ran for 107 yards on 20 carries. When it rains it pours and it seems as if UCF is in a torrential downpour as it dropped its fifth game of the season 45-31 to Tulane. You can’t turn the ball over five times and expect to beat anyone and with no running game whatsoever — leading rusher Taj McGowan had 11 yards on nine carries — its hard to compete against anyone. One potential bright spot was the emergence of quarterback Tyler Harris who passed for 156 yards and three touchdowns after replacing an ineffective Bo Schneider who had only completed 54% of his passes and had three interceptions. After a slow start Memphis and quarterback Paxton Lynch (305 yards, two touchdowns) got things going in the 24-17 victory over USF. While the offensive stats aren’t eye-popping like they were against Cincinnati — 425 total yards and 20 first-downs — it sometimes takes a grind out game like this to keep you focused as a team. The defense showed that it can limit an opponent until the offense finally gets going as USF only scored once in the second half. Nine Memphis receivers caught passes on the night including Doroland Dorceus who had a 55 yard touchdown reception that sealed the victory. The offense is normally the focus of the Navy report, and its understandable as quarterback Keenan Reynolds is the leader of a potent rush offense, but against Air Force, it was the defense that took center stage as it forced four turnovers on the way to the 33-11 victory. Air Force didnt score until late in the third quarter and its only touchdown came when the game was already decided. Reynolds, known more as a runner, showed off his passing skills throwing for 110 yards — including a 27 yard touchdown to Thomas Wilson — to go along with the 183 yards rushing on 24 carries. The victory also puts Navy in position to recapture the Commander-in-Chief trophy as the end-of-the-season battle with Army is the only thing in its way. Tulsa is usually the team putting up gaudy stats but in the 38-24 loss to Houston the defense let the team down as it allowed 638 total yards. It’s hard to conceive that passing for 324 yards could be considered an off game, but for Dane Evans it was, as he did not have a touchdown and was intercepted once. Zach Langer was also held in check as he only rushed for 62 yards on 19 carries — his lowest output of the season — but he did rush for three touchdowns. The tough thing about changing the mentality of a losing program is that it sometimes reverts back to old habits and that’s what happened in the 49-23 loss to ECU. After heading into halftime with a 23-21 lead, both sides of the ball left its game in the locker room. The defense forgot how to stop anyone and the offense could not move the ball at all. Quarterback Matt Davis passed for 249 and two touchdowns but the most telling stat was 13 rushes for -17 yards as he was sacked eight times. Tight end Jeremiah Gaines led the team in receiving with 96 yards on four catches — including a 60 yard score that gave SMU the early lead. Tanner Lee had one of his best games of the season as he had four touchdowns and passed for 190 yards in the 45-31 victory over UCF. Rae Juan Marbley, Roderic Teamer and Taris Shenall each had an interception as the Green Wave defense forced five Golden Knights turnovers. They were outscored 21-7 in the fourth quarter so that is something that the team still has to work on — finishing strong. 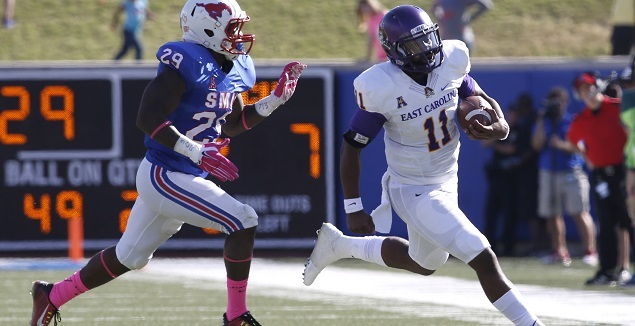 James Summers Quarterback ECU: For the second straight week Summer provides the ECU offense a much-needed spark. Coach McNeil should have an easy decision moving forward with Summers as the starter because it seems as if the entire team is more galvanized with the junior under center.